The DayOne Waterbag is 10-liter personal water purification unit with integrated filter and backpack straps. The Waterbag provides all four of the functions needed to treat and safely store drinking water: (1) collection, (2) transportation, (3) treatment (specifically the P&G Purifier of Water packets), and (4) hygienic storage. It is compactly designed for immediate distribution after a disaster to treat contaminated freshwater sources, protecting survivors from the leading causes of diarrheal disease. At first sight, the 10L Waterbag looks much like a family-sized water bladder with a few extra straps and buckles attached here and there. But it is really so much more than that. 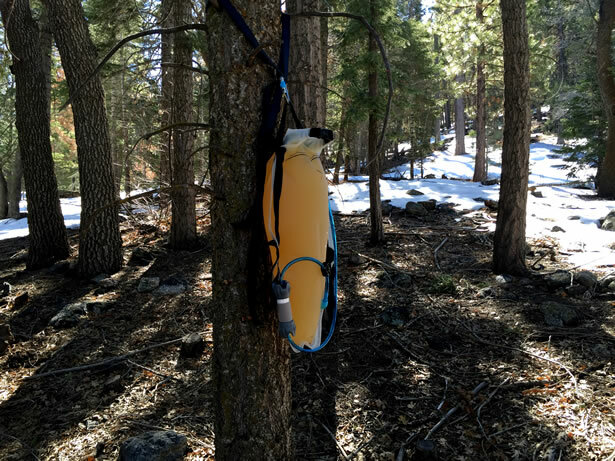 The Waterbag is about 30″ tall, almost 14″ at its widest point, and weighs nearly 21 ounces empty. It is made from a thick BPA-free EVA (ethylene vinyl acetate) which is a tough see-through food-grade plastic for its superior durability and resistance to contaminants. Inside, there is a 4″ x 5″ folding baffle designed to prevent the bag from expanding beyond 4″ deep. The extra-wide opening is a clear advantage making the Waterbag very easy to fill and clean. 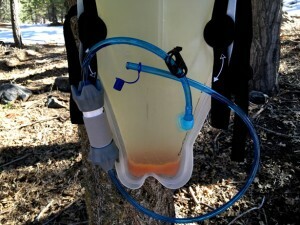 The bag is filled by submerging the opening below the surface of the water until the water level reaches the fill line printed at the 10-liter (2.5 gallon) mark. I like to use a bandana or shemagh as a prefilter to filter some of the sediment out before it makes it into the 10L Waterbag. The opening is sealed much like a common drybag. Simply fold the top of the bag tightly at least three-times before fastening the buckle which will prevent the end from unrolling. The opening is a full 14″ wide so there is plenty of room to clean and disinfect the inside of the bag with a mixture of lightly bleached water before drying it thoroughly as directed in the instructions. Each 10L Waterbag also comes with a detailed instruction manual, a plastic-laminated pictographic instruction card, 60 P&G Purifier of Water packets, a packet opener, and a 2-ounce syringe for backflushing the tubing and inline filter with the bleach solution as well. The Waterbag has sturdy 1″ nylon webbing running down both sides of the bag. On one side of the bag, the webbing forms an adjustable backpack with 2″ shoulder straps for easy portability. The pack is comfortable enough to wear carrying the 20 pounds of a full 2.5 gallons of water. Most of all, it leaves your hands free to carry other gear. Along the top is a handle strap with a buckle to simplify filling and hanging the pack. On the other side of the pack, there are two handles designed for shaking the bag once the P&G Purifier has been added. On the right shoulder strap there is a small pouch large enough to hold a dozen P&G Purifier packages and the opener. A few inches up from the bottom of the 10L Waterbag there is an integrated 1/4″ ID adapter port, a 0.2-micron Gravityworks inline filter, and a 12″ length of blue tubing connecting the two with a tube clamp to control the flow out of the bag. At the other end of the inline filter is a 28″ section of blue tubing and a plastic cap at the end. Not only is the 10L Waterbag a practical means of transporting water over a distance, it is also a water purification and filter solution. It can be used to treat freshwater so it will meet US EPA and World Health Organization drinking water standards with its unique dual-treatment approach. To use the 10L Waterbag to purify water, first make sure the tube clamp is closed securely so the water won’t run out the hose once the bag is filled. Next, simply fill it with fresh water all the way up to the 10-liter fill mark and add a single P&G Purifier of Water packet before sealing the opening and buckling the strap. After about 30 minutes or so, there should be nearly 10-liters of clean potable water ready to go. The P&G Purifier of Water is a flocculant and disinfectant powder that contains iron sulphate, calcium hypochlorite, and other ingredients that are designed to eliminate most bacteria, viruses, cysts, dirt, soil, sediment, pollutants, and arsenic. These are many of the same ingredients used to treat water by municipal water systems, but they will not make seawater drinkable. P&G Purifier of Water packets can safely be stored for 3 years from date of manufacture and should be rotated along with your food storage rations. To test the 10L Waterbag, I filled the bag with freshwater up to the fill line and added the packet of P&G Purifier. Then I folded the lid three-times to seal the water in and snapped the buckle to prevent the end from unrolling. After hanging it from a tree, I began to shake the bag back and forth for about 5 minutes as directed by the instruction manual. However, I did notice that some the flocculant was sticking to the sides of the bag requiring little more effort to shake it down. After about 20 minutes, the water began to clear and the rest of the flocculant settled to the bottom of the bag. Once the flocculant settled to the bottom of the bag and the water completely cleared, it was ready to drink. At that point, open the cap on the end of the tube, and release the tube clamp to let the water flow. I found the water to taste a lot like tap water, but it was clean and clear nonetheless. The DayOne 10L Waterbag is certainly a viable solution for transporting 2.5 gallons of water over a great distance whether you use the water treatment packets or not. The straps distribute the load evenly across your back and leave your hands free to use a walking stick or carry other gear. However, I think a hip belt and a sternum strap would make it that much better. 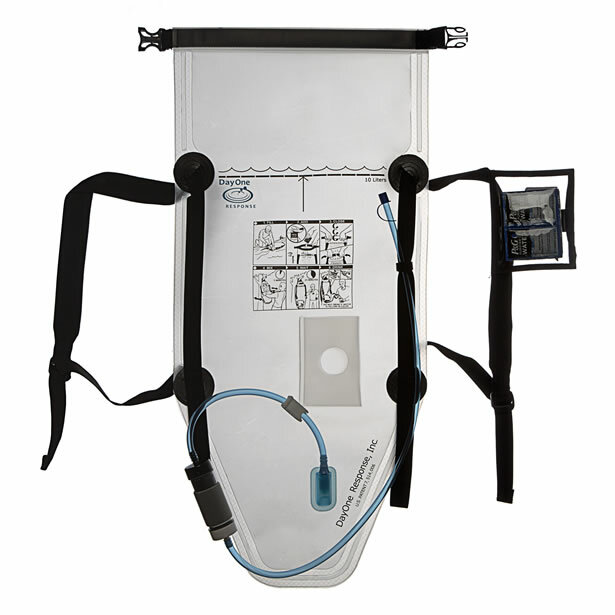 The 10L Waterbag is also a viable water treatment and filtration solution. The only real drawback to me is the short lifespan of the P&G Purifier of Water packets. Three years just isn’t long enough in my book. But as long as you rotate them regularly, you should be fine. DayOne Response develops and supplies innovative solutions for disaster relief specifically for clean drinking water and is a distributor of P&G Purifier of Water packets. DayOne Response also distributes water and sanitation products globally to relief organizations, government agencies, and public and private entities. DayOne Response supports the Procter & Gamble Children’s Safe Drinking Water Program’s goal to deliver more than 2 billion liters of clean drinking water each year by 2020. DayOne Response offers two water purification products globally, including the DayOne Waterbag and the P&G Purifier of Water treatment packet.